Locle has been selected as a finalist for the 2009 Red Herring Europe 100.
Business & Leadership magazine’s Owner Manager Guide to Digital Business did a case study on Locle in relation to location-based digital commerce. The article also covered other Irish companies Mobanode (bluetooth proximity marketing) and Tagggit (mobile photo geo-tagging). Le Mobile 2.0 brought together some of Europe’s most influential mobile plays over 2 days of indepth presentations between March 10 and 11. 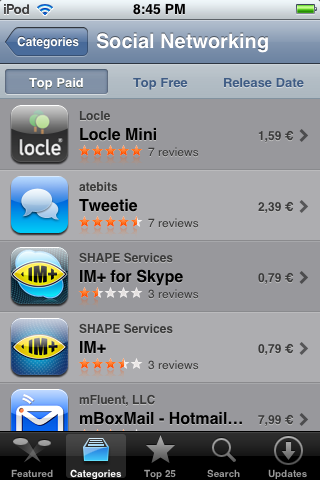 Two days after release on iPhone App Store, Locle Mini for iPhone and iPod Touch is #1 in the Social Networking “Top Paid” chart. Pat Phelan from MaxRoam (Cubic Telecom) sees where Locle is going, in relation to monetizing user location: bargains. Or in industry speak: location-and-time based coupons. Locle looks to third-party networks such as Ocode and Yoose to supply the coupon campaigns, passing the campaign to the relevant audience and sharing the payout. However, it’s companies like NearbyNow who are best positioned to deliver the scale needed.